I had a very brief experience working with Uber Eats. It actually only lasted one day. Here’s the story. After hearing rumors about higher wages and fewer cyclists at Uber Eats, I thought that I’d move over to the dark side. I headed over to the Uber offices in Westminster to signup. I ended up completing the process before I realized I had even started; it was over in a matter of seconds and they didn’t even ask me if I could ride a bike. I was also using a Deliveroo bag but they didn’t seem to care about that either. I opened up the app before lunch and waited for the flurry of orders to pile in. Guess what. They didn’t. Spending time in the saddle. At 7 pm I got my first order. A MacDonald’s Big Mac. Seeing as Deliveroo don’t work with MacDonald’s this was going to be a new experience. Long story short: it was dreadful. I cued for 20 minutes trying to get the order and the coke bottle spilled all over the inside of my bag whilst cycling (not Really MacDonald’s fault but it still pissed me off). I proceeded to get two more orders that night. When I finished it was 11 pm and I was fuming. I’d made £17 (which is pretty good for three orders), but these were some of the longest orders I had ever done. Also, Ubereats don’t have any zones, which means I was delivering to the whole of London. Yes, they only give you orders which are near to you, but they don’t keep you in your zone. This meant that after three orders I was in central London and had to cycle almost an hour to get back home. Not what you want to do at 11 pm at night. To be fair to Uber Eats they are a lot better than when I signed up, but I really think that they are more designed for motorcycles rather than for cyclists. Anyway, if you want to sign up for Deliveroo then you can get a £50 bonus using the link below! 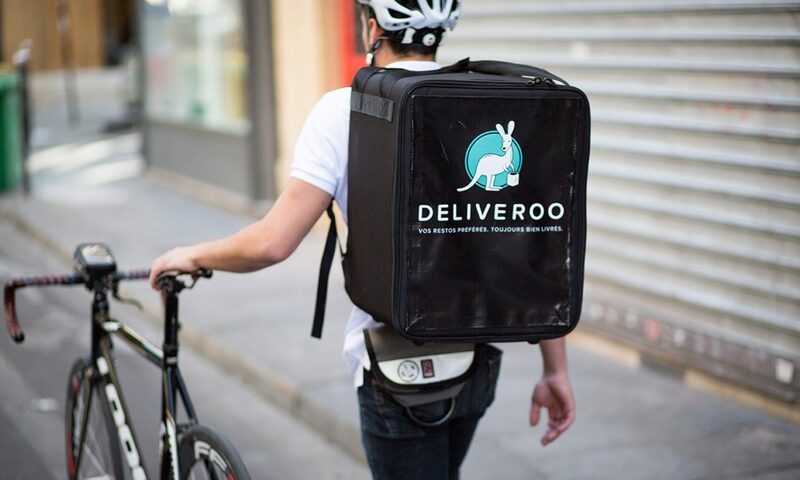 Read next: How much do Deliveroo pay? On the Deliveroo signup page, it very clearly says that riders can earn up to £120 per day. Yes, we do have to remember the inclusion of the “up to” part of that statement. But, it does make you think. Can you actually make £120 per day with Deliveroo? Will Deliveroo make you rich? £120 per day is the equivalent to £43,800 a year!!!! Seeing as the AVERAGE wage in the UK is £27,000, that’s a pretty big difference! Yes, I know that figure of £43,800 is assuming you work 365 days of the year. But even if you only work 250 days of the year, you’re still going to make £30,000. So, let’s break down how many orders you’d need to complete to make £120 in a day. Assuming that you work the 3 hour rush hour at lunch time and then another 3 hours in the evening, that’s a total of 6 hours worked. So to make £120 in a day you’ll have to be making £20 an hour. I you’re on the old system of £7 and hour (+£1 for every delivery) then you’d need to make 13 orders every hour!! That’s 78 orders in one day! If you’re on the new pay per delivery system it will be slightly easier. The fee varies on location but I’m going to calculate this using the London fee which is £3.75 per delivery. To make £120 you need to do 32 orders in one day, which is just over five orders per hour. This is much more manageable, and could definitely be done by a moped driver in busy areas. A cyclist would have to be seriously quick. What I haven’t talked about here is tips, which I suppose could greatly increase your income (if you actually get any). So, in conclusion, £120 per day is a pretty long stretch unless you’re a moped driver. But, if you’re delivering in some super ritzy area, your tips might blow your earnings sky high (I once made a £6 tip for cycling 100 metres from restaurant to customer!). Enjoy this article? Check out my article on how much Deliveroo riders get paid. When do Deliveroo riders get paid? Payments come through from Deliveroo into your bank account every 2 weeks, on a Monday. Ok so Deliveroo fees are a bit of a touchy subject right now, but currently, there are two methods of payment: Per Hour and Per Drop. These vary depending on which location 🌎 you are delivering in. This means that your total fee is dependent on how far you have to cycle. This makes the payment system much fairer. I have had many a time where some orders have taken me half an hour to deliver and I got paid no different; this new system is much better! Per Hour: This is the old scheme of paying £7 per hour (might be £6 in other areas) + £1 per delivery + tips. This scheme works well if you’re based somewhere quiet where orders aren’t coming thick and fast. With the pay per hour, you have to apply for your shifts each week, and stick to them. It can be very difficult to change shifts and get new ones (due to the Deliveroo support system being pretty stagnant). The best way to do it is just to apply for every single shift when you first sign up, and then just cull off the ones you can’t make (this is really easy, check out my article on how to do this here). Per Delivery: This ranges from £3.75 to £4.25 per delivery + tips. This is the new system, and although it had a pretty rocky start, I think it’s starting to work well now. If you’re based somewhere busy or maybe just work at peak times (evenings and weekends), then this system works well. For example, on a typical evening, I do about 10 orders. On a pay per hour system, this would make me £31 in a three-hour shift. Whereas, in a pay per drop I could make up to £42.50. Furthermore, with pay per drop you can log in and out of the app whenever you like, so you’re not confined to the shifts you’ve been booked onto. This makes it so much more flexible than the pay per hour scheme because you don’t have to spend ages trying to apply for shifts (and you also don’t need to tell anyone if you’re not going to show up one day). The main problem is that if your area becomes super congested with riders, you’re very unlikely to get any orders. Most of the time you won’t get a choice with which system you work with, it’s usually just assigned to the area. As the service grows in popularity, I think Deliveroo are trying to transfer the whole system over to pay per delivery.